Singles' Day is Catching on in the U.S.
San Mateo, CA, November 11, 2016 – Singles’ Day, a holiday that originated in China and encourages singles to purchase a gift for themselves to celebrate being single, is increasingly being observed in the U.S. 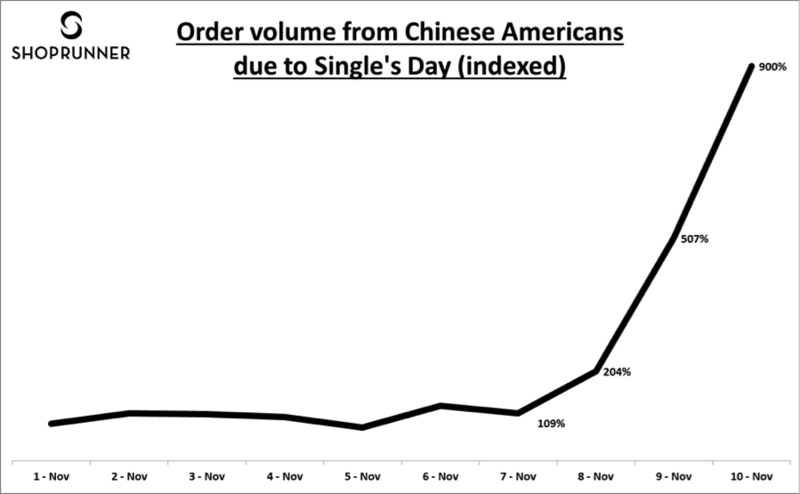 According to ShopRunner, the volume of online orders by Chinese Americans has increased by 900% in the three days leading up to the November 11 holiday. Cities that saw the greatest increase in orders include Chicago, New York and Atlanta. Singles Day originated in China and is celebrated annually on November 11. It has now grown to be one of the largest online shopping days in the world. ShopRunner is a shopping service that helps its members save both time and money. ShopRunner members receive unlimited complimentary two-day shipping and free return shipping on every purchase made with ShopRunner at more than 140 online stores including clothing, shoes, beauty, electronics, home and gifts.